Wellington II W5397 crashed in the North Sea 14/7-1942. The aircraft belonged to RAF 12 Sqn. Bomber Command and was coded PH-? T/O 00:09 Binbrook. OP: Duisburg. The aircraft crashed into the North Sea. 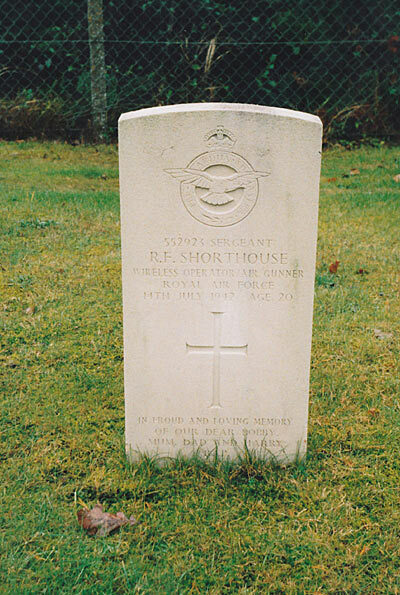 On 25/9 Wop/ Air Gnr Sgt Robert F. Shorthouse was found driftet ashore near Østre Oksby. He was laid to rest in Oksby cemetery on 30/9-1942. Pilot P/O David A. Welch, Observer Sgt John G. Reid, W/Op-Air Gnr. Sgt John G. Strachan and Air Gnr. F/S Harold H. Harrison RCAF have no known graves and are commemorated on the Runnymede Memorial.